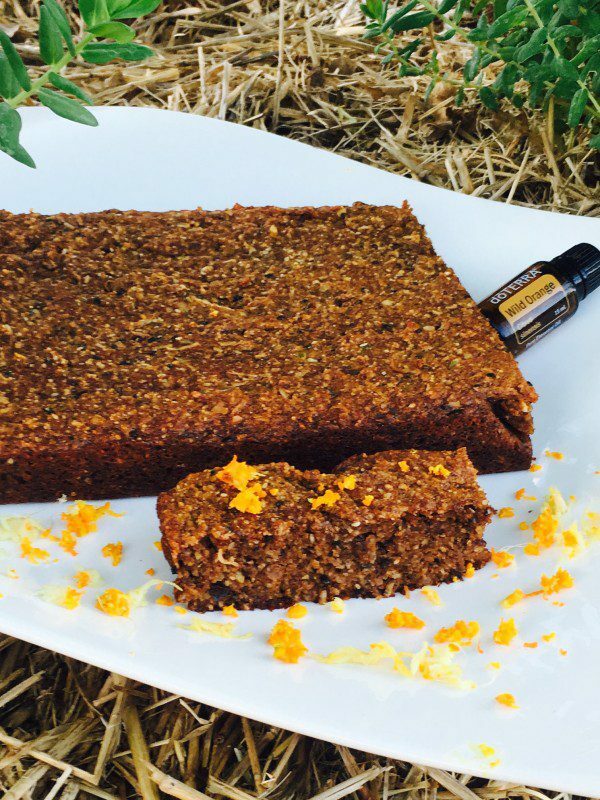 A Zesty Cake that looks like a carrot cake without the carrot… with the spice and orange thing going on. A one blender/processor throw it all in and blend baby. 100g almond meal (grind raw almonds) or other, sunflower seed meal for eg. Using your Thermomix, or a blender, throw all ingredients in to blend together until combined. Using any of the following… lamington tin, brownie tin, loaf tin, pyrex dish, muffins or springform pan… pour your mix into lined tin(s) and bake at 160 (maybe 180 oven temp depending) for the required time, adjusting time to suit type of tin used. 35 mins for brownie/small lamington or slice tin, longer for loaf style and say 20 mins for muffins. Cover with foil if needing to bake beyond 25-30 mins. Option…A spoonful or 2 of Coconut cream is a nice addition to the syrup, though bear in mind that it will not set as firmly at refrigeration if you wish it to be more of an icing. The addition of a small amount of coconut oil will help it set more firmly but again, not at room temperature. Pour syrup icing over the cooled cake or refrigerate syrup a few moments to set firmer before spreading on the cake and either serve or slice to freeze in pieces wrapped in gladwrap. Thanks Kerry for this awesome recipe!! Why Cereal Is Unhealthy For Kids. What Does a Naturopath Eat? Copyright 2019 © goodMix Superfoods.